Ahh, so peaceful. View of the mountains from a park in Banff. The final weeks of term have flown by in such a rush, that I’m still struggling to come to terms with the sudden inevitable end of this semester. I don’t quite understand where the time has gone, but gone it has and in its place I am left with this sudden feeling of nostalgia – already! It doesn’t seem like two seconds ago that, on a hot and sunny September morning, I was arriving at UofC with a slight feeling of trepidation but mainly absolutely buzzing to meet my roommates and get all settled in. Now here I am, sat in my hat and jumper, on a dark December night, pretty darn knackered but feeling all emotional about how far things have come and how many new things I’ve tried. The wonderful places I’ve visited, including Penticton, Banff and Edmonton. The delicious food I’ve tasted (and believe me, it’s all been delicious) like: Poutine, Tim Hortons donuts and the dreaded Kraft Dinner. The fun things I’ve done such as: roadtripping on a Greyhound, learning how to ski and attempting to line dance. And of course, the fascinating and wonderful people I’ve met, and the friends I’ve made, along the way! But for now, I kinda just want to curl up in a ball and hibernate for a bit. This term has actually been rather long compared to Durham standards and I’m starting to feel the pinch. Orientation began on the 1st of September and now the end is finally in sight… my last exam is on the 16th of December. As soon as it’s over I’m flying straight out of those lecture-room doors and quite literally straight to Vancouver, to spend the Christmas period relaxing and exploring with my auntie. Cannot wait! So as usual, now is the perfect time to fill you in on what’s been happening over the past few weeks, apart from that last push to reach those academic deadlines. I watched my first men’s basketball game! It was just a university league match at home and yet it was taken far more seriously than I would have ever believed. It was a really fun evening and such an exciting sport to watch. Plus the cheesy in-game entertainment including cheerleaders, a brass band, a breakdancing solo and a tricycle race was simultaneously nothing I could have imagined and yet everything I could have hoped for. It was certainly worth the painful -20°C weather that I had to stagger through for 5 minutes to get there. Go Dinos! 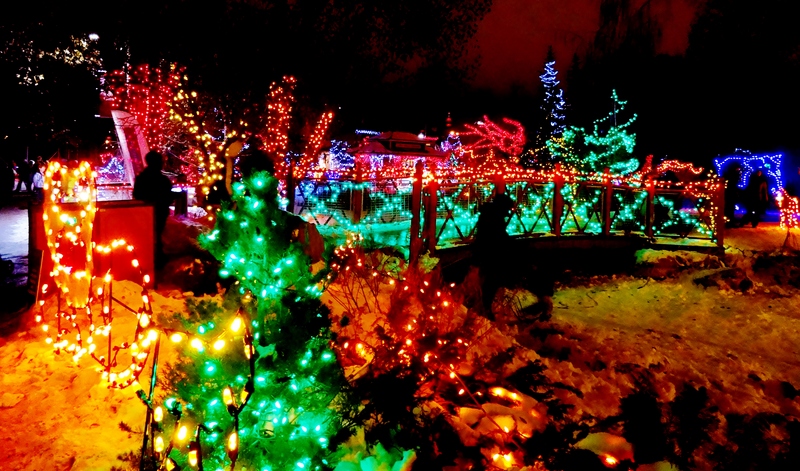 If only those Candy Canes were real… Calgary Zoo Lights. I also watched my first NHL (National Hockey League) match at the Scotiabank Saddledome: Calgary Flames versus Arizona Coyotes. We were so high up that I got vertigo just looking at the ant-like players. However even from 3000ft above, hockey is one of the most exhilarating, fast-paced, and enthralling games you could possibly watch and not just because the players get into some pretty brutal scraps every two minutes. Additionally the basic rules are simple enough that even I can understand them (unlike American football which I just can’t quite get to grips with). Once again there was some pretty hilarious in-game entertainment including a life-size bowling match which involved slingshotting spectators across the ice! Crazy! Watching live hockey was possibly the most distinctively Canadian of all my experiences so far and one that I hopefully get to do again and again. Go Flames! 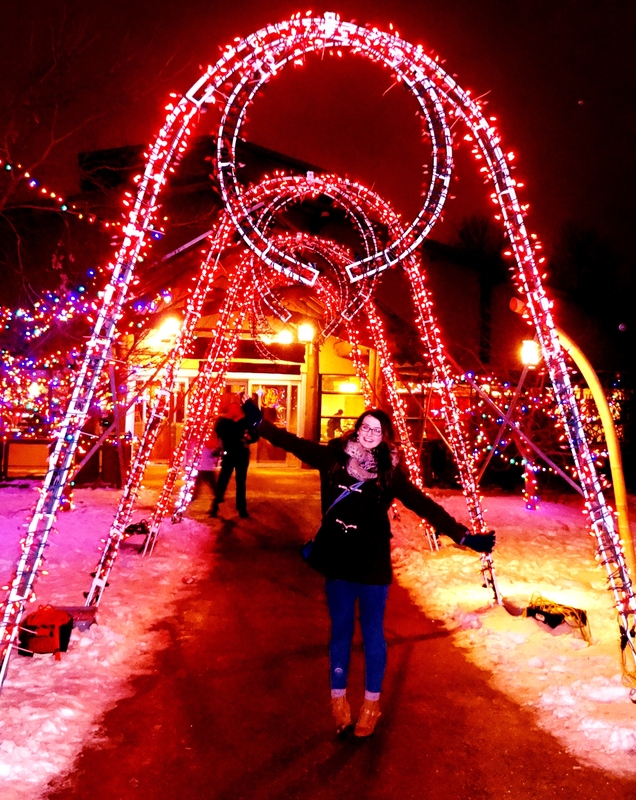 To get in the festive spirit, we decided to wrap up warm and go see the Christmas lights at Calgary Zoo. My goodness, I’ve never seen so many glistening, twinkling fairy lights in one place (1.5 million apparently)! They were wrapped precariously around tree-top branches, coiled into hundreds of animal shapes and pretty much positioned in any available space. I think I was just as excited as a small child! It was just so pretttyyyyy! 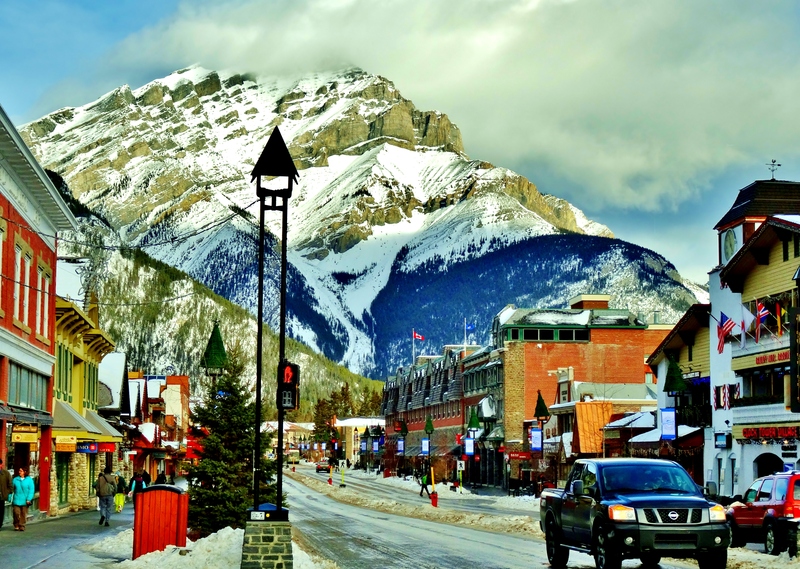 I also went sight-seeing and Christmas shopping in Banff; a beautiful town and popular tourist destination. Surrounded on all sides by the Rockie Mountains and just a stone’s throw from Lake Louise, it was so lovely to get out of Calgary, soak up some fresh, crisp mountain air and take in the views… from inside a warm, homely café or two! Hopefully in the spring time, I can get out there and explore some of the hiking trails and paths because the sight of the Rockies always leaves me awestruck. It simply is incredible. And I know there’s a lot more to discover. So I guess that’s it for now! I can’t wait for the next few weeks but I’ll be sure to fill you all in on my Vancouver adventure when I get back. Merry Christmas and happy holidays!